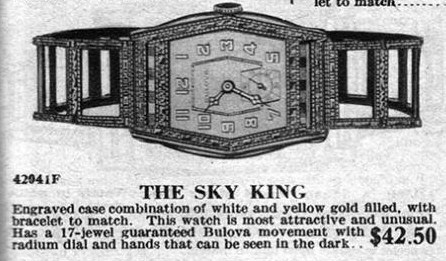 Since this record was first entered, the XXIXXI pattern on the yellow gold (vs the "fish" pattern in ads) and the absence of the four sets of lines running lengthwise w/ the bezel on the white gold suggest that this case may not be a Sky King, or perhaps is a Sky King for which we don't have a matching ad to date. So IMO this is a two star tentative ID at best. I'm feeling a little inconsistent w/ that tentative, as it just as easliy could be unconfirmed without ad. Both the fish and XXIXXI pattern cases can fit the same crystal. I don't know how the crystal package is marked, and don't know if the various crystal catalogs indicate several model names that take this same crystal. If the catalog(s) indicate that the crystal fits several model names, perhaps one of the "other" models which take this crystal could as easily be a tentative ID. In that case, this "other" tentative name from crystal specs would need to be a model for which we don't' have an ad showing otherwise. Time and more information will help address this, but it's starting to sound like a one star unconfirmed. The engraving is not consistent in the ad with the subject watch. 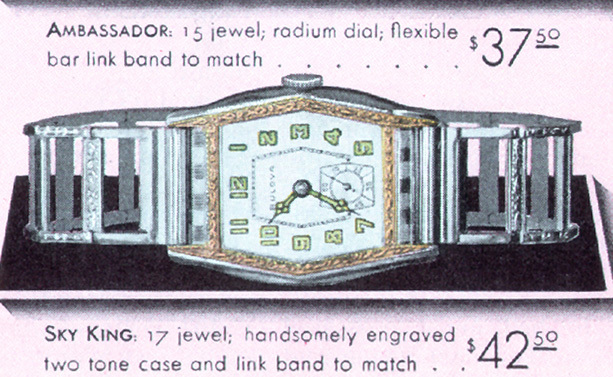 The advert doesn't show the small plain rectangle boxes intermitently in the engraving sequence found on the subject watch in the gold area. Unless there is another ad showing this aspect of the engraving I would say unknown at this time were my thoughts considered. The other ads for the Sky King do not have the definition to see the engraved parts properly, so neven though I personally think this is a SK, only two ticks as not enough data. Wayne Do you have case and/or crystal dimensions for this beauty? Please and thanks. Sure looks similar to the sky king in shape/style sans engraving patterns. Tentative from me for now....but it's closer to unconfirmed or even unknown. I do think having as a tentative or unconfirmed Sky King helps us further ID, but I'm trying to be consistent. Note the difference in the release wiith the raised gold numbers and solid hands (black or gold) versus the earlier release with the lume dial and hands. Ads show the transition nicely. Shame the second advert isn't of better resolution.